Jessica Unger will be teaching “Who’s That Dead White Guy on a Horse? A Walking Tour“, an outdoor version of her previous KCDC class about D.C statues. KCDC spoke with Jessica about the class and the role statues play in public real estate. KCDC: Can you describe your upcoming class? 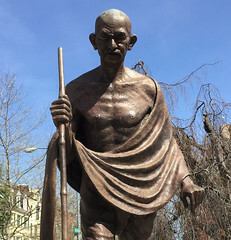 JU: In my walking tour, I plan to visit a handful of statues that can help illustrate some bigger points about the aesthetics, history, and politics of statues in D.C. We’ll see the oldest statue in D.C., a monument to the originator of a pseudoscience, and the statue that stood in the way of WMATA. My hope is that people will leave the tour with a mental toolkit to be able to better appreciate (and question) the statues that they encounter daily. KCDC: What do you find intriguing about D.C. statues? JU: I’ve always been interested in the public art of every city where I’ve lived. What are we saying when we make the choice to display something in this shared sphere? When I moved to D.C., I was especially fascinated by how public art functioned in this town. Not only do we have the interesting juxtaposition between which spaces are managed by the District and the Feds, but as the Capital there is this sense that important individuals (both nationally and internationally) should be recognized with some public art real estate here. There are just so many statues in town. I was curious about who was being honored, but perhaps more than that, I was curious about who decided to honor them, and when. It’s really interesting to think of statues as artifacts of their time, and consider what a future of monuments will look like. 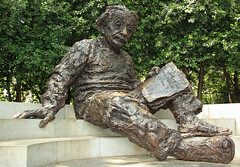 KCDC: What’s your favorite D.C. statue and why? JU: I’m quite partial to the Gandhi statue on Massachusetts and 21st. The statue is much more human in scale, and it’s one of the few where you can make “eye contact” with the figure. The landscaping likewise encourages you to sit and reflect, so it feels like there are more opportunities to think about Gandhi as a historical figure and as a human being. He’s standing on a rock, but he’s not on a pedestal, literally or figuratively (please forgive that joke). KCDC: As the title of your class suggests, there are a lot of statues of “dead white guys on horses” in D.C. What are some statues that aren’t of that demographic? JU: Thankfully, the peak of “dead white guy a on horse” statues hit in the early 20th century, and there have been lots of great monuments built in the intervening decades that not only honor people of color and women, but also individuals who didn’t ride horses in their primary occupations (aka folks who weren’t soldiers). 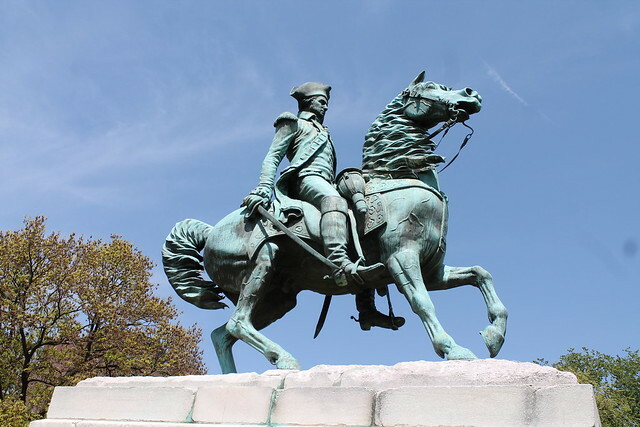 Of the statues in D.C., roughly 20% are equestrians. There’s only one dead white lady on a horse: the Joan of Arc in Meridian Hill Park. There’s also one white dude who is with a horse but not on it: the Abraham Lincoln at Lincoln’s Cottage. A horse definitely seems to be the most effective symbol of a warrior, but it’s interesting to see what other symbols were used to convey a person’s accomplishments. Those that we honored for their brain power are pretty likely to be holding — you guessed it — a book or a scroll. KCDC: If you could choose one person worthy of having a statue in their honor in D.C., who would it be? JU: I’m pretty jealous of the Harriet Tubman statue in Harlem that was built in 2008. I think D.C. could likewise use a monument to one of the most badass women in American history. But then again, we will be seeing her on our money soon! So maybe we should go with something super meta and have a statue of Clark Mills, the artist who cast the famous statue of Andrew Jackson in front of the White House, the George Washington in Washington Square, and the Statue of Freedom on top of the Capitol Building. He had a studio on 15th and Pennsylvania and he’s buried here in D.C. Seems appropriate, no? We probably wouldn’t have all these dead white guys on a horse without him, for better or worse. Rebecca Kraybill is a writer who calls D.C. home after growing up in Lancaster, Pa. Her favorite stories to write involve unlikely people coming together in quirky but powerful ways, like the time knitting covered a bridge in Pittsburgh. Her first KCDC class was in 2014 on how to bike in the city, and she’s been biking around ever since.